Showing results for tags 'fuji'. I've just got my hands on an X-E3. It seems to be a little bit of a forgotten camera in the Fuji line up, even though it is right up to date with the same sensor as the X-T2, X-T20 and others. I've only really had an hour or so of handling it so far due to other commitments and haven't shot properly or got to the bottom of all the menus and settings. The first thing that stands out is the size - it is small. A bit bigger than my old Nikon J1, although with the 27 f/2.8, it almost squeezes in to the same case I use for the J1 and 10 f/2.8. The buttons are tiny too, although they seem well enough spaced out to avoid mis-pressing them. There is a shutter speed dial and exposure compensation dials as well as two command wheels (front and rear), but there isn't an ISO dial like some of the bigger bodies. I haven't got the hang of what the various buttons do and what the command wheels can be programmed to do yet. It has a slight ridge on the front rather than a grip and I find I'm twisting my finger down the front of the camera to hold it - something that will not be comfortable for extended periods, but given the size and the way I plan to use it, it is easy enough to slip into a pocket, so you don't need to be holding it all the time. I'm not sure how it will feel with bigger lenses, as I've only tried the 27 f/2.8 and the 18-55 so far. The view finder is off to the side, but I don't find that a problem. Even with glasses, I can get close enough to see the full viewfinder (perhaps because my nose isn't in the way). The view finder also lets you get a good view around the camera if you can manage that sort of thing. The viewfinder seems responsive although I managed to provoke some flicker with low shutter speeds under fluorescent light. It seems to jump quickly into focus and in some regards feels similar to the J1 rather than my D7000, even though with the 24 MPixel APS-C sensor it represents an upgrade in that regard too. A couple of quick high ISO shots look good and it will probably be OK a couple of stops beyond the D7000 (and obviously way beyond the J1). OIS on the 18-55 seems good too. Obviously the 27 and 18-55 might not appeal to those wanting the more traditional manual handling common to the Fuji system, the 27 completely lacking an aperture ring and the 18-55 with an unmarked ring, which although it clicks nicely, will continue to rotate fully and take you back to wide open from fully stopped down (that was the command wheel behaviour with the 27). Hopefully the coming weekend will provide some more shooting opportunities and allow some more detailed comments. I've got a long love affair with the original rangefinder cameras (Leica M4-P & M6) and the now digital rangefinder style cameras (Fujifilm X-E2, X-E2S & X-E3). I don't know if it is due of the fact that their viewfinder is located off center (meaning not in the same optical axe of the picture taking lens). But that peculiar camera body design seems to stimulate my creativity and my motivation to brought the camera in places and at moments that I will have a tendency to ignore. The Fujifilm X-E3 is the fourth version of a popular model design that many photographers like to bring with them as their main camera or at least as their back up camera body that happens to becoming eventually their most used. The X-E3 is using the same 24MP image sensor that the X-T2 and the X-T20 have. So the picture quality is at par of the two last mentioned models. One of the thing which most interesting when you are using a rangefinder style digital camera is the fact that they are less noticeable, less protuberant, less intrusive in front of the subject.. This characteristic to be more discrete is always appreciated by the spontaneous photographer on the street, during a travel and even when you taking a candid portrait of a person (The camera seems to be less "serious"). Many people were tempted to make the comparaison with the Fujifilm X100F which a compact APS-C digital camera doted with a similar fixed lens of 23mm. If you combine the Xf23mm F2.0 lens with the Fujifilm X-E3 the two cameras will give the same angle of view. But the Fujifilm X100F is more a (large) pocket camera while the Fujifilm X-E3 is an interchangeable lens model that have a more standard dimension. Fujifilm X-E3 w/ Fujinon XF55-200mm F3.5-4.8 R LM OIS Most people will talk in length about the good or the bad handling of a camera model. It is always a very personal and intuitive impression at the end. Ergonomics are designed by technicians that are biased by their own physical and cultural differences. All this has been said one thing that I have experimented with the Fujifilm X-E3 is its fine ergonomic in terms of the camera body and lens combination and I am surprise how good and easy it is still true even when you are using a larger zoom lens such as the Fujinon XF55-200 F3.5-4.8 R LM OIS. As a travel or street photographer I fully appreciate this ability. About the tiny Fujifilm EF-X8 electronic flash which is included with the furnished camera accessories I was skeptical of its practical use but I have found it very easy to bring with me and positioning on the X-E3 (You can leave it at rest on the Fujifilm X-E3 camera at its down off-position). Dont forget that the EF-X8 is using the battery pack power of your camera. As a fill-flash and as an emergency flash unit are may be the two best tasks of the EF-X8. For a more extended use of an electronic flash it is better to couple an external unit doted with its own power management. Window back lightning interior ambiant light exposed Using a fill-in flash can be one of the most rewarding thing to do with interior photography with subject that are backlighted during the daylight period. The color temperature is similar between the ambiant natural light and the electronic flash output and the only big task is to choose an interesting exposure balance between the two in preserving or not the shadows or even simply voluntarily underexposure the ambiant (effect often use in fashion photography). 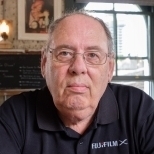 Using the Fujifilm F-X8 as a fill-in flash Small in-board camera flashes are a very handy solution but they are located usually too near the taking lens and often interfering with the lens hood that you have to remove to prevent incomplete flash coverage. The Fujifilm EF-X8 give a more elevated flash reflector position. You just have to push it in its down position if you want to shut its power off. Officially the Fujifilm X-E3 is a less "sporty" camera model than let's say the X-T series models such as the X-T20 or the X-T2 or even the X-H1. The off-center viewfinder may create a small different perspective between you naked eye and the image recorded by the taking lens but if your concentrate your attention to your viewfinder it wont be noticeable. So spontaneous photography stay a strong opportunity. As for most of the Fujifilm X-series camera models, the controls of the photo basic parameters are designed in a similar fashion way as it is used to be for the traditional analog (film) cameras. Shutter speed, lens aperture, exposure correction and focusing options including manual adjustment can be selected with direct dials or control rings. The others parameters have to be adjusted through push buttons, touch screen options or using the versatile joystick located beside the rear screen. All these functionality controls need to be learn before really be able to master them without hesitation. Using the Quick menu (Q) and reprogramming certains function controls can facilitate the handling of the Fujifilm X-E3. Most of the menu option presentations are easy to understand and interact but some functionalities may need more time and essaies to get the habit. There is a lot of autofocusing modes at your disposal that can tailored your shooting workflow. The all-"AUTO" option (lever next to the shutter speed dial) is a good idea for emergency snapshot without disturbing your already programed setting. The electronic viewfinder (EVF) is fine detailed with all the (configurable) information you need and got an auto-rotation presentation very useful for vertical framing. In some specific situations the image on the EVF will be more contrasting making more difficult to evaluate low and highlights. For people who are wearing glasses like me the eye relief is more limit and will ask you to pay more attention to the corner of your framing composition of your subject. The back and none-orientable live screen (LVF) give you a better reviewing rendition of your picture facilitating a deeper image analysis. The side location of the Fujifilm X-E3 electronic viewfinder may give you a better viewing confort compare to the centered viewfinders of the X-T series models. The instant picture review is easier and the reviewing (Play) push button is located on the bottom right side of the LVF. In all the Fujifilm X-E3 is a very convenient camera model that respond correctly to the compact size device but without sacrificing too much better handling compare to the larger DSLR model type. If you are already an owner of other Fujifilm X-series models you will fully enjoy that the X-E3 is using the same battery packs and external electronic flashes without forgetting that it is part of the same optical lens mount system. The Fujifilm X-E3 doesn't have an in-(camera)body-image-stabilization system (IBIS) and will rely on your ability to set and handle the camera to avoid generating blurry from the photographer's movement. Of course you can couple a lens with an optical image stabilization (OIS) that will help you to prevent that phenomena and further permit you to select lower shutter speed in low light situations or simply to get a smaller lens aperture (for increasing the deep of field). As a loosely rule of thumb, no stabilization is available with focal fix lenses (except for the new XF80mm F2.8 OIS Macro and the XF200mm F2 OIS) and it is the contrary with zoom lenses (with some noticeable exceptions such as the XF16-55mm F2.8 Pro). At this day the Fujifilm X-H1 is the only X-Series model equipped with an IBIS. What I am appreciated the most of the Fujifilm X-E3 is its compactness and its very discrete status in regard of other people ressent when they are facing the camera. It is what can call not only a user-friendly camera but also a subject-friendly photo device. Combined with a short fixe focal or short zoom lens, the X-E3 appears to be part of the family. It is not perceive as an agressive intruder of our life compare to the look with the DSLRs. So the interaction between the photographer and the subject is very different and much more positive. If you like Black & White photography you will adore to work with the Fujifilm X-E3. This lovely camera model offers you a choice of two monochrome reddition, standard Monochrome and Acros, with 3 different filtering variations, Yellow, Red or Green. So you can literally transform the X-E3 as a Monochrome camera without further expensive investment. (This remark is also good for the other Fujifilm models). Is it sufficient to simply have a good camera device that can deliver not only nice, well exposed and focused pictures but which is also a creative tool fun to use and to bring with you? Sure there will always be more performing camera models now and in the future and that is inevitable in this race for better human crafting. But in the mean time we have not to forget that the most interesting and rewarding think is to do photography. In a sense the Fujifilm X-E3 fulfill nicely the task of proximity photography essential in close urban situations or in interior contexts. The Fujifilm X-E3 is a compact photo companion that is not only a competent tool but is also an inspired creative device. The lenshood you see in this photo is a replacement for the Fuji offering that I don’t like. It is solid aluminium and a 52mm screw thread, the cost of this hood shipped from China including P&P ordered though Amazon was £2.63, hence my use of the word bargain. Spring has arrived and this spot has a nice view over the lake. So far we've only had a short period of winter with frost and snow around here - it was nice that it came during the holidays. A shot from late afternoon just before twilight. Was out testing an old Minolta 50/1.7 a while ago and met this little fellow. Every autumn I look forward to watch this Ginkgo in its autumn colours. Hostas shutting down after the season. A rare opportunity in November around here - a sunny afternoon. Fuji X-E1 with Minolta 55/1.7 anno late 1960's. Just some happy horses on a hot summer evening. I've had some days off and the weather was great for shooting some spring landscapes. Couldn't decide which composition to post of the last two so you get both versions. I have compiled some data for comparing the weight of different camera systems, Nikon FX, Nikon DX, Fuji X, Sony Nex and Micro Four Third (which is a combination of Olympus and Panasonic in this case). I've choosen a set consisting of a wide angle zoom, standard zoom and a tele zoom. In addition I've added a normal lens and a macro lens. On top of this I've tried to match the properties of the lenses and cameras in order to have the comparison as fair as possible. However, a full match cannot alway be accomplished across the systems. In particular the Sony Nex system strikes me with its' lack of lenses of certain categories. For macro lenses I've tried to choose lenses equivalent of 90mm on 35mm film, but for Sony this was not possible to achieve yet, and the selection of lenses has been limited to the manufacturers' own lenses. For m43 the selection has been done among Olympus and Panasonic lenses since they both manufacture camera bodies for the system. So here we go: Edit: Added filter sizes and averages of them. Last two weeks I was taking the new Fuji X100s with me whenever possible and now I'm starting to get accustomed to it more and more. My normal street setup for the last 4 years was the D3 with a 50, but when I started in photography I had only one lens—35/2.8, so this is sort of back to the roots for me. For now I use the new Fuji mostly in A priority with ISO auto 200-3200 and minimum shutter of 1/125. I sought to post here few photos that I took while trying to "understand" the new camera.